→7 Ways You Are Doing Keyword Research Wrong and Here is How to Fix! No matter whatever online business you are managing, getting more traffic always remains an extreme desire. Increasing website traffic may bring more visitors to your site and consequently better chances for increasing sales as well as revenue. On a planet where every business is running in a rat race to get more eyeballs and turn prospects into customers, you need to do things differently. None can deny by the fact that organic search engine traffic is the most effective free source of web traffic that smart businesses are looking for. Organic traffic is not only free but also has the potential to bring highly targeted visitors to your site. That is why the smart marketers are preferably focusing much on search engine marketing. When it comes to search marketing, any SEO campaign is incomplete without keyword research. In fact, search engine optimization starts with keyword research. Targeting the right Keywords may increase your blog traffic by 3 folds effortlessly while wrong Keyword selection may cost you money as well as efforts in content creation and promotion. 7 Ways You Are Doing Keyword Research Wrong and Here is the right thing to do! Many marketers commit simple mistakes while performing keyword research and they regret later. If you are unknowingly doing keyword research wrong then you need to read this as you’ll learn to fix it. I’m listing few common mistakes while doing keyword research. You might not be committing all of these keyword research mistakes, but I am sure at least one of these mistakes is reducing your business growth and making you leave money on the table. The common marketers think that GKP hints them that how competitive is a keyword for their content creation and consequently how difficult it would be rank their website for that keyword. The common rule of thumb is : Target low competition keywords from Google Keyword Planner because high competition keywords are tough to rank. It is the most common mistake. Because the reality is different. The fact is that Google Keyword Planner is a keyword planning tool built for Google AdWords users. So basically it shows the competitiveness for a particular Keyword in Google’s advertising network. Although it is still helpful for publishers but relying on GKP’s data heavily is your mistake. -> How to Fix it ? Don’t rely heavily on Google Keyword Planner data. What seems to be highly competitive, the same keyword may be ideal option to make $$$$ because if that keyword is competitive in GKP that means more and more advertisers are bidding for that particular keyword. In result, you have an opportunity to make profits by crafting your content around that keyword. And who knows, your site’s authority and your personal abilities might together make it count really big. SEO landscape is quickly changing. What used to work earlier is now a thing of past. Even what’s working now might not be effective tomorrow. Same is the case with the importance of understanding user intent in keyword research. Understanding user intent is the art of detecting and fulfilling users need. It is the ability of any marketer to learn his/her user behaviour and know what they are looking for. Knowing what your users want is crucial for providing your visitors most exact information. best Nike running shoes for tennis etc. Now suppose if you are a female searcher, don’t you hate it ? if Google shows you result for “best Nike shoes for men”. You’ll certainly hate it ! As a result, you’ll instantly leave that site and turn back to search results to choose other options. This is what we call it : Pogosticking. The behavior of users that click on a result, then “pogostick” back and forth between the search results and different websites, searching for satisfaction. Pogosticking hurts your site’s SEO. Even if you are ranking on top #1 position for a particular keyword, your search ranking may decrease gradually due the Pogosticking. Google understands that your top ranking content is failing to provide quality information to users. Hence, slaps your content and rewards those who are making users happy. The root cause of Pogosticking is – keyword research mistake while understanding the searching intent of your users. Understand your users well. Know your audience demographics, location and their behaviour well. Create content around their intent to fulfil their needs. Alexa siteinfo is an ideal place to know your site’s audience demographics at beginner level while Google Analytic helps you learn your users at advanced level. Knowing my audience well, I’ll prefer to go with 2nd keyword because that’s how I’ll be able to satisfy my audience perfectly. You need to do the same with your niche. If you are running a sports blog that mainly focuses on soccer, targeting keyword like “best Nike running shoes for tennis” is a keyword research mistake while “best Nike running shoes for soccer” is an excellent option. However, an average user who is looking for “best Nike shoe” might be interested in “Nike fashionable shoes” rather than “Nike shoes for running”. Know your audience searching intent and create content accordingly. When performing keywords research, many marketers forget about looking into their strength and limitations. Google Keyword Planner shows the same data for everyone – whether you or your competitors. So targeting keywords that your competitors are targeting is a bad idea and may be considered as yet another keyword research mistake. Because you and your competitors have the different set of limitations and strength. Your site might be less authoritative than your competitors and in such case, targeting the same keywords that your competitors are focusing will lead you to nowhere. Because it would be easier for them to outrank you as they have higher authority (in eyes of Google) than yours. Keep adding valuable stuff keeping an eye on blog post ideas that attract backlinks and build some backlinks from untapped backlink sources but make sure you don’t overdo it. Building backlinks from the sites having less authority and at more frequent pace may be detected as manipulation hence responsible for ruining your blog SEO. As your site’s authority increases, you’ll be able to get desired results with even better keywords. Admit it ! We all want more traffic. And proper on-page SEO may help you increase targeted traffic. That’s the reason why many marketers keep themselves busy in finding traffic building keywords. If you are also working hard to find traffic building keywords, then you are right to some extent because more traffic means more sales and revenue. Although, it is not a keyword research mistake yet it is net less than a mistake. Targeting traffic building keywords is a silly idea. A better option is to target keywords that drives sales. Quality traffic with better conversion rate always outperforms huge traffic. Usually, how-to tutorials and guides in your niche are meant to solve people problem, help them learn and easily educate themselves. These are the keywords that bind your audience with the emotional trigger. But commercial keywords are keyword phrases containing prefix or suffix like : buy, sales, reviews, order, best etc. This is where the real game begins. Build your content not just around the informational keywords with high search volumes but also around commercial keywords with low search volume. That’s how you may increase your blog revenue and sales without worrying about traffic. However, again there is a warning : Don’t overdo it ! Your ultimate goal should be providing valuable information (even if it is a commercial keyword). Gone are the days when you could build content around short tail keywords and rank on 1st page with some blackhat techniques. The SEO landscape is changing. Although popular brands are still targeting popular keywords. But smart marketers are proceeding with long-tail keywords because long-tail keywords are comparatively easier to rank in Google. The above graphic depicts how longtail keywords are dominating the search ranking. If you are still not focusing longtail keywords, you are way behind modern SEO approach. The keywords marked with green color in above pic are longtail keywords. 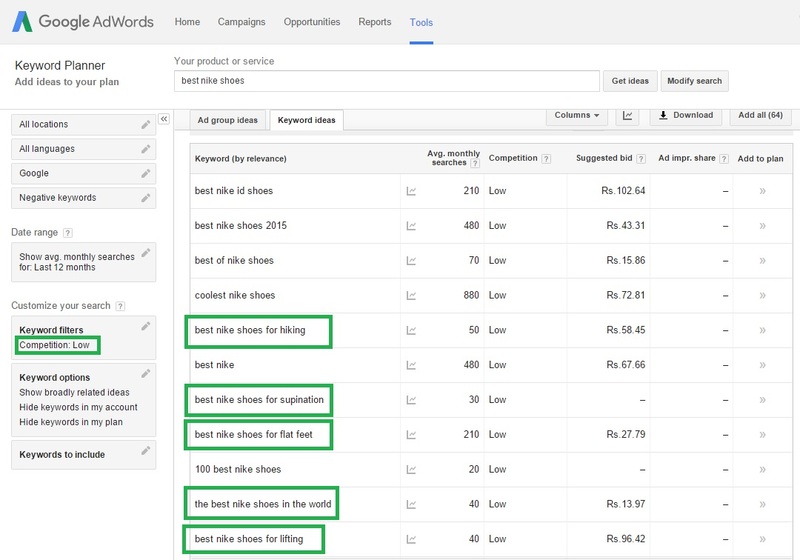 Creating content around these keywords will be more beneficial than that of short tail keywords like : best Nike, best Nike shoes etc. Although Google Keyword Planner is a free tool to find longtail keywords but finding profitable longtail keywords with GKP is not so easy for beginner. You need to have advanced skills for keyword research otherwise you’ll end up spending long hours only to come-up with few profitable keywords. Keyword Research software tools like LongTailPro makes it super easy to quickly find profitable longtail keywords in bulk. Simply enter some seed keywords and hit Generate Keywords & Fetch Data button. Within few seconds, LongTailPro will show you a large number of keywords which are longtail as well as profitable. How to Use LongTailPro to Find Keywords that Make Money in Any Niche. Must read this to learn. But even if you know the keywords for which your competitors are ranking, stealing keywords and building content around those keywords is a bad idea. Because when it comes to keyword research, most of the bloggers and publishers start with finding low competition keywords without understanding whether they are exactly going to rank for that keyword. It is also a similar keyword research mistake like mistake #3 (discussed above). An ideal content creation goes with uncertainty over whether the content will rank for this keyword or it’ll miss again ? Throwing stone(s) in darkness and hoping for fruits is a bad wish. SEMRush allows you to find competitiveness of any keyword. Simply go to Keyword Difficulty Tool of SEMRush and enter the list of keywords for which you want to know the difficulty level. Even better option is LongTail Platinum that takes your domain authority from MOZ credentials into account and analyzes page authority, domain authority, link juice etc. factors before providing you exact keyword competitiveness. Keyword Research Mistake #7 : You are Focusing the Same Keywords that Others are Focusing! Last but not the least, targeting the same keywords what others are targeting is yet another keyword research mistake that everyone ignores. This is the root cause of all competition in search results. Although it is good for the improvement in the quality of search results as more and more publishers are competing with each other to create better content and provide more useful information to searchers. But downside is : publishers are running in rat race to prove their supremacy for a particular keyword while ignoring the thousands of other untapped keywords. You need to understand that there is no big deal in re-creating the wheels. However, if you can create and share an even better wheel than what exists, then it is worth it. If you are doing what others are doing, you’ll be lost in crowd. Instead find and target those untapped keywords which are yet to be explored. Doing so, will help you rank easily as there will not be any such competition. Since no one else will be competing with you, it’ll help you reduce the extra SEO efforts you usually make to rank for your desired keywords. And perhaps, that’s how you may contribute in making the search engines even better place for information on almost any subject. Keyword research is the most crucial step for successful search marketing. Since search marketing is the future of content marketing, so avoiding such basic mistakes may dramatically improve your search ranking and organic traffic as well. Once you start focusing the right keywords, you’ll no longer have to put extra efforts, time and money for search engine optimization of your site. Consequently, you’ll be able to bring more targeted traffic and drive sales effortlessly. What other keyword research mistakes you are making ? Your views and queries are highly appreciated in comment box. At the tender age of 18, Rahul Dubey has built his own 6-figure online business blogs. TechReviewPro.com is one of them. Rahul helps bloggers and digital marketers excel online with his free digital marketing tutorials and online courses. You may learn traffic building tips, SEO secrets, and how to make a profitable online presence on his personal blog LearnDigitalwithRahul.com. You pointed very important points about keyword research and I like the way you provided the solutions for each mistake. I think most bloggers including myself are doing such kind of mistakes while doing keyword research, therefore, this post can be very helpful. I’m glad you liked the post. Just pointing out mistakes and leaving readers in a state of uncertainty is bad idea. So I just tried to take it a step further by helping you learn how to fix those mistakes. That’s the idea behind providing solutions for these mistakes. Hopefully, fixing these mistakes with provided solutions will help you improve your search ranking and get better results. Thanks for taking time to share your views. What a useful information you’ve shared with us today on Enstine’s blog….is great having you here today. I started using SEMrush recently and honestly, I can tell you it is a fantastic SEO tools. It presents some opportunities I never so discover in Google keyword planner, and it’s ability to display some of the “not provided” keyword in Google makes it an excellent SEO tools. All the points you listed above are valid in the real world of keyword research, I have committed some of these mistakes in the past and have learned my lessons. Thanks for sharing, hope to meet you on your blog. I’m glad you found it useful. My pleasure to meet you here. Yes, you have pointed important word “not provided” which is one of the limitation of Google Analytics. Though with advanced techniques and tools you may easily find them but having an excellent tool like SEMRush speeds up the process. Thanks for sharing your thoughts and I’m also thankful for your time to drop a valuable comment here. I follow every article of Rahul Dubey in his Blog Techreviewpro.com. He is very good in explaining everything. and thanks for amazing article in this blog. Its my pleasure to read your post in Enstine blog. I’m glad you liked the post. However, I doubt over authenticity of your thoughts about LongTailPro. Yes, I agree that its a nice keyword research tool that speeds up the process of finding more longtail keywords but since LongTailPro as well as many other keyword research tools take the keywords data into their database from Google Keyword Planner itself. So I would prefer GKP more reliable and authentic. Thanks for the kind words and I’m really thankful that you follow my every article on TechReviewPro. Oh boy – I have a love/hate relationship with keyword research. I know it is important, but hate doing it because I always feel like it is a shot in the dark. Maybe I find the right one, but maybe not – and is it all a waste of time anyway? So, thank you so much for pointing out these strategies that don’t work and explaining how to do it right. This article is definitely a keeper. Neena recently posted…Amazon.com Opens Amazon Books – What Does That Mean for Your Business? “If something is important that must be done” – If you feel keyword research is important for your business, you must not avoid it. Yes, it is like a shot in dark but with some professional tools and advanced keyword research skills you may easily figure out whether you are going to hit it or miss it. Thanks for your valuable time to share your views with us. Everyone starts from ‘Zero’ but don’t worry you may easily and quickly learn things. Let me know if I may help you anyway. Nice to be here again after a bit gap. Good to see Rahul here with his amazing tuto! Presently I am using SEOby Yoast. It is quite pleasant experience for me also to meet such awesome (new) people and getting their valuable compliments. I’m really thankful to Enstine as well as each of you. SEO by Yoast is one of the best WordPress SEO plugin as it manages any site’s on-page SEO well. But you need to further fine tune it for better results and also, put your own efforts to make things work for you. Thanks for your kind feedback man. Looks like I’ve been making a lot of mistakes as far as keyword research. I use mainly keyword planner and Google suggestions to find keywords. A lot of bloggers do recommend Longtail pro but I haven’t put the effort to purchase it. I get mainly referral traffic from sires because I focus on a specific much of bloggers and communities. But I also don’t want to limit my Strategies either. Thanks for the education Rahul! Have a good one! Thanks Enstine for having Rahul as your guest! I’m so glad I could help you fix your Keyword Research Mistakes. Yes, I agree. In fact, that’s a million dollar worth thought : “one should never limit his/her potential”. Hopefully, exploring these new potentials will work for you. Thanks for dropping your valuable comment. Thanks for sharing this great detailed info on keyword research. I still have problems with it at times but as everything, it is coming easier with time and practice. Thanks again for the pointers to help. Practice is the only way that leads to perfection. And keyword research is not an exception. With time and practice, you may have perfection in keyword research also. However, let me know your problems if I may help you anyway. Welcome to Enstine Muki’s blog…this entry of yours is superb – and covers all the basics. However, I’m particularly interested in the information versus commercial keywords in point 4. You see, it’s a shame that most Webmasters don’t even know that something like this exists…for such Webmasters, ther singular fact that they are attracting traffic is enough – even when the traffic fails to convert in an abysmal manner. I covered this point vividly in my upcoming book: SEO 101. Your writing sincerely rocks and your insight is superior…do make the day great! Thanks for the warm welcome and I’m glad you liked my entry. Yes, I agree that most of webmasters are completely unaware of fact that traffic without conversion is pointless. That;s the reason why I tried to educate everyone with these insights. BTW, I’m quite excited about SEO 101. Let me know once it is up, I would love to learn. Thanks again for kind words and your valuable feedback. It great to meet you and Indeed some of the mistakes you pointed out are important to stay away from. I having been making some of this mistakes and I am very pleased you gave a fix for everything. Researching Keyword is important, so are the readers on your blog and to get satisfaction out of your readers, you have to create content that solves their problem and add value. Since Traffic from search engine are more targeted, giving them complete satisfaction is indeed very important. You’re awesome and I can’t wait to connect with you. Its my pleasure to meet you. And I’m so glad I could provide you a fix for your mistakes. Yes, you have pointed important thing here : “To get satisfaction out of your readers, you have to create content that solves their problem”. Don’t you think it’s kind of a give-and-take scenario ? If you satisfy your readers, you readers make you satisfied. Thanks for taking time to share your valuable insight. Looking forward to connect you. Really an excellent resource and guide on keyword research and how to do it the right way. thanks and keep it up. I’m glad you liked the guide. Hopefully, the resource would help you do keyword research in better way. Looking forward to hear more from you. Indeed an excellent post. Thanks for providing complete details, that how to overcome these silly mistakes while keyword research. Your step by step tutorial make it easy for blogger to go through. I’m glad you liked the post. Thanks for the good compliments. Hopefully, the step-by-step tutorial will help you avoid those silly mistakes while performing keyword research. I’m feeling wonderful to see you here guest posting. Even though we’ve read numerous keyword research guide but I must say that it didn’t bore me because it’s comprehensive, explaining. Hats off buddy for this in-depth awesome content. That’s amazing feeling to see you here. I’m so glad that you liked the post. Hopefully, this in-depth post will help you perform better keyword research. Looking forward to hear more from you. Thanks for this timely post. I haven’t done kw research for a while (relying on ads instead) but recently decided i need to get back into the game. I’m glad I could help. Yes, you need to get back into the game. Let me know if you need any help further. First time reading your articles Rahul. I’m glad you loved my article in the first read. Hopefully, you’ll have more fun while reading my articles in future. Let me know if I may help you anyway. A basic need of new Blogger to understand this kind of information, After reading this article , I get more knowledous information above article. An impressive and interesting information, and thanks for sharing tricky tips of SEO. I’m glad I could help. Looking forward to hear more from you. Definitely very informative article on keyword research. Yes, we should over come such mistake while doing keyword research for our content. We should not go for just search volume but we should think about the trend of keyword and it’s value. You have explained that point very well! Targeting long tail keyword is a good idea to get more traffic by ranking top on the SERP easily and we should focus more on long tail keyword. Anyway, thanks a lot for sharing this useful article with us. It’s my pleasure I could explain 😉 . Anyways, thanks for sharing your valuable insights and kind feedback. You had covered all the major things in this article and made it helpful. From last few days, I had reading some of your articles and I found that you are putting more efforts in your articles and trying your best to serve better content. I would also suggest you to focus on building genuine email subscribers on your blog. Try to add links to subcribe to your newsletter in the middle of your post. This will boost your email list. Either way, keep up the awesome work with your blog. I’m glad to know that you liked the article. I usually try to stick to the basics. Serving better content is the need of present era, especially when there is huge competition all around. When you succeed in serving the content that your audience needs, it becomes the hallmark of your blog – that’s something I’m experiencing these days on my blog. Thanks for your suggestion dear. Yes, building an email list is something where I need to work as it has cost me a lot due to ignoring in my early days of blogging. But fortunately, I have started working on it. After your suggestion, I have enrolled myself in some email marketing and list building courses and getting some good results. I really appreciate your time for sharing valuable feedback and suggestion. Looking forward to learn more from you. I totally Agree with you, It is really very effective post for beginner like me. and keyword Research is very very important to do proper SEO and working on site. Thanks Rahoul for sharing such these great points. Yes,keyword research is really important specially when you have new blog. I’m glad you liked the post. Hopefully, it’ll help you do better keyword research. Thanks for your valuable feedback. Let me know if you need any further help. I have been following your blog techreviewpro and the way you maintain the blog is awesome. Thanks for this detailed guide of keyword research and it helps us a lot. It sounds pleasant that you have been following TechReviewPro. 😉 I’m glad that the detailed guide could help you. Sure ! I’ll keep helping you all. Thanks for sharing your valuable feedback. I must say this is one of the best article about improving your SEO skills using keywords research and rank higher on searches. Thanks for sharing your valuable feedback. Looking forward to hear more from you. It’s a relay good post about keyword research . I enjoyed reading it. It answer on so many important points. thank you Rahul. james recently posted…A Guide To Paid Visitors Traffic: How to promote a ClickBank product ? I’m glad you enjoyed reading it. Hopefully, it’ll help you perform better keyword research. Let me know if I may help you anyway. It is really easy to research on long tail keyword. But as a novice I am not getting so well. This post may improve my ranking and I may make a good keyword research. Although it is easy to perform keyword research using tools like LongTailPro but not necessarily in all cases. The Google Keyword Planner tool still dominates not only because it is free but also it provides some amazing functionalities that no other third party keyword research tools can provide. However, you need to have enough skills to make work for you. Anyways, if you want to learn how to perform keyword research using LongTailPro, you need to follow the link (I have provided in post above) of detailed tutorial written by Anil on BloggersPassion.com. However, if you still find it tough to understand, let me know I’l request Enstine to write a detailed tutorial here. Hopefully, this would be helpful. One of the best article of keyword research, it’s highly appreciable and noteworthy article. How to use of keyword and utilize of it, to use very easily to this article. I’m glad you liked the article. Hopefully, this would help you perform better keyword research. Honestly, I’m probably doing my SEO all wrong … which is why I’m reading your posts. Unfortunately, it often seems like, the more I learn, the more I realize I don’t know! Yes that’s true, the more you learn something, you realize the lesser you were knowing. Hopefully, this guide will help you perform better keyword research. Let me know, if you have any query, I’ll be happy to help. This was an ultimate guide. I was making a mistake listed in this post. I will surely eradicate it soon. thanks man, You showed your expertise through this post. I would also invite you to see my recent post which is also on the same topic- keyword research..
I’m glad you termed it “ultimate guide”. Eradicating the mistake is always beneficial as it takes you to the next level. Thanks for the invite, I have read your post and found it so useful as I couldn’t help myself tweeting it out and leaving a comment as well. You have done a remarkable job in helping readers learn about keyword competition analysis. This is certainly going to help your readers as well as your loyal following in long run. Hi Ensitne, These are really unique ways to research effective keywords.Keyword research is always a difficult job for me.Hope this guide will help me out. Today I learned another way to use keywords in the post title. I agree, keyword research is a difficult job but with time and learning, you’ll become better at keyword research. Yes, you were expecting it right as the two mentioned tools are very quality product available in the industry. I wonder, how you couldn’t find any of them? Perhaps, you skipped them. Hopefully, this will help you do better keyword research. Let me know, if you need any help. After using keyword research tool, if we had to use a keyword in a certain time, and then after doing research again, there is a change in the keyword word combinations, do we need to rename the url of the page that already exists? What I understand from your question is that you want to know whether you need to change URL after making a switch in your primary keyword? Well, it is not primarily required. However, if you have completed changed the old keyword and added a new keyword that wasn’t in the title or URL earlier then I would suggest changing the URL. But make sure, you do a 301 redirect from old URL to new URL so that you don’t loose the link juice, trust flow and authority that the old URL gained over time. Hopefully, I could answer your query. Let me know if you have further questions. An awesome post! I wonder how much study you have done to write this post. The post is really informative to us. The prime reason why I liked the post is; it helped me the understand the basic structure of Google Keyword Planner and also to use the long tail keywords. Previously I was using keywords with 2 words mostly. So, now I’ll chose keywords more than 3 words (if possible). And the solutions of the mistakes you put forwarded are really very appreciative. Bookmarked this site for my further SEO learning’s. Thanks for writing. I’m glad I could help. Let me know if you have any query. cooool post buddy , love to read it , i red it again and again , inspires me , one of a great post on your website . hope you will serve us with such kind of articles. I’m glad you liked it Luqman. Sure, I would keep serving the blog readers with more useful stuff. Keep visiting. I am guilty of the first mistake mentioned of relying on googles low medium and high rating to dictate to me as to which keywords to target and this was pointed out to me that in fact the GKP indications are for those seeking to do PPC campaigns. besides for the GKP what would you recommend? You are not the only person who makes this mistake, in fact, there are many. So don’t feel guilty for it. Hopefully, you’ll eradicate this mistake and take your keyword research to next level soon. A lot has changed to GKP since I wrote this post and I’ll soon come up with an update to it. Just stay tuned. I’m not sure whether Christina would help? But I would be happy to help you, let me know what problem you are facing as a novice user? You made it really easy to understand how to do keyword research the right way. I really learned something new about google keyword planner tool and other tools. You helped me alot so I just wanna say thanks to you. I’m glad you liked it. Also, I just checked out your article “How to Do Keyword Research for SEO (Step by Step)”, it was a nice read. Well-written article. I’m glad you liked it. Let me know if I may help further. thanks for giving a very good brief info on keyword research,this will definitely going to help me on how to use google keyword planner effectively for researching good keywords. I’m so glad to help. Hope, you’ll be able to find better keywords. One of the best articles I have read on Keyword Research 🙂 So nice to see competition understood and explained so well. Too many inexperienced people out there telling others to target low competition keywords, not understanding that it should be the opposite. I tried LongTailPro, but wasn’t as impressed with it as others seem to be. Maybe I am weird, lol. It feels great to be the author of an article which stands among the best articles you have read on keyword research. My pleasure I could explain. I have been following this for a long time. Now, I’m a little mad that you have told the world one of the best ways to do Keyword Research. I have found that using long Tail Pro to find keywords that are not in the URL or in the H1 tag really does help with ranking as well. If you just shoot a few “longer tail anchor text” from a PBN or High PA DA and TF link it seems to cause the page/post to rank much faster. Thanks for sharing such nice information. The way you have shared the detailed comparison between F Google’s FREE Keyword Planner and Long Tail Pro is quite nice. Great Work I must say!!! Thanks for sharing this great detailed info on keyword research topic. I still have problems with it at times but as everything, it is coming easier with time and practice. That’s true! With time and practice, everything becomes easier. So keyword research as well. Thanks Muki realy you are great person for share a valuable information for keyword research mistake. its really helpful for person who start a new blog.